One of the most ancient Republican policy hobbyhorses has been eliminating Medicaid’s status as a federal-state entitlement program guaranteeing health-care services for low-income Americans and certain other categories of needy people. You think killing Obamacare is an obsessive Great White Whale for conservatives? Attacks on Medicaid’s basic structure date back at least to the beginning of the Reagan presidency (fittingly, since the Gipper was one of the most visible opponents of the original Medicare and Medicaid proposals back in the early 1960s). In fact, an effort to arbitrarily “cap” federal Medicaid payments was one of the few early legislative setbacks for his administration. GOP efforts to turn Medicaid into a “block grant” (i.e., a proposal in which the federal government would appropriate a fixed sum of money that states could use to deal with the Medicaid population, with the federal contribution expected to wither away over time), terminating any individual entitlement to benefits, have come back over and over again like a recurring nightmare. There was a Medicaid block grant in the 1995–96 Gingrich budgets that Bill Clinton repeatedly vetoed. George W. Bush proposed the same thing in 2003. It was a regular feature of all those “Ryan Budgets” during the Obama administration. And most recently, Republicans tried to smuggle it into law as part of their unsuccessful bills to “repeal and replace” Obamacare, under the guise of rolling back Obamacare’s expansion of Medicaid. 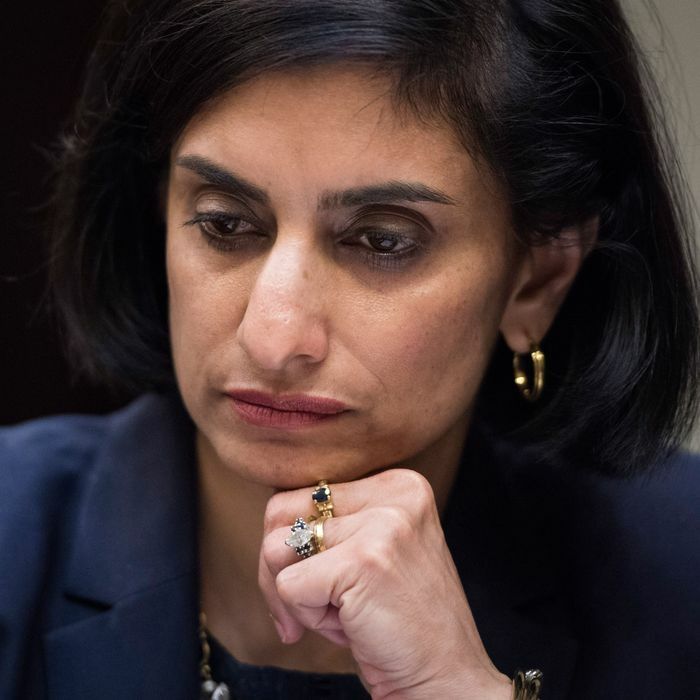 Even as such frontal assaults on Medicaid continued, the Trump administration, under Medicare and Medicaid director Seema Verma, has been working hard at using “waiver” powers originally designed to help states cover more people under Medicaid to let them move in the opposite direction via work requirements and other provisions aimed at discouraging eligibility. Last year there was even talk of letting conservative states impose an arbitrary lifetime limit on how long childless adults could receive Medicaid benefits, which would have been a pretty clear abrogation of congressional authority to oversee the program and of Medicaid’s “entitlement” status. The administration’s plan remains a work in progress, and sources said the scope is still unclear. It’s not yet known whether CMS would encourage states to seek strict block grants or softer spending caps, or if new limits could apply to all Medicaid populations — including nursing home patients — or just a smaller subset like working-age adults. If Verma goes ahead with this scheme, a legal challenge will most definitely arise. But it’s an indication of how determined conservatives are not just to fight the long-term trend of making Medicaid a de facto universal health coverage program for the poor, but of rolling it back as far as possible. The potential damage from all of Verma’s various cut-by-waiver schemes was limited significantly by Democratic midterm gains at the state level, and more indirectly by successful Medicaid-expansion ballot initiatives in conservative states that showed the program’s widespread popularity. But make no mistake: most ideologically-prone Republicans hate Medicaid with the heat of a thousand suns, and they won’t give up trying to hamstring it, restrict it, cut it, or kill it so long as a devious way to go about it has yet to be deployed.